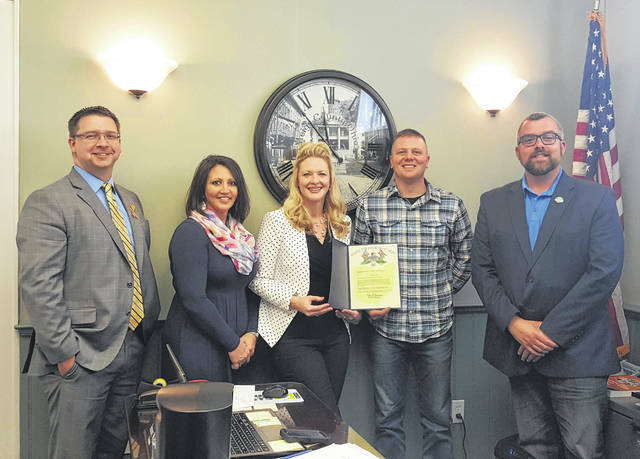 Kelly Smith, center, the representative for Ohio Treasurer Robert Sprague presented a recognition to the Meigs County Commissioners and Bicentennial Committee during the recent Meigs County Commissioner Meeting. Sprague is the first of the state officials to present official recognition of the Bicentennial. MEIGS COUNTY — Less than two weeks away from the Meigs County Bicentennial Celebration, final details are being ironed out and the complete schedule has been released. While the main celebration will be held April 26-28, the unofficial first event will be on Thursday, April 25 when the Meigs County Commissioners hold their regular weekly meeting in the Chester Courthouse. The nearly 200-year old courthouse is the oldest standing courthouse in the state of Ohio. The meeting will mark the 200th anniversary of the first meeting of the Meigs County Commissioners which took place in April 1819. The main event begins on Friday, April 26 with an Education Day at the Meigs County Fairgrounds for area school children. On Friday evening will be the annual Chester-Shade Historical Association benefit dinner held at Meigs High School. The dinner will take place at 6:30 p.m. in the high school cafeteria and will feature a Civil War menu. Dan Will, president of the Chester Shade Historical Association, stated in an announcement of the event, following the meal will be a story-telling time, “Township Tales & Tidbits.” Representatives from each of the 12 townships in Meigs County have been invited to tell a story, tale, or elaborate on some article or item of historical significance, relating to their township’s history. To cap off the evening, the 7th Ohio Volunteer Cavalry Civil War Reenactment Group will demonstrate an after-dark firing of their artillery on the adjacent lawn. The cost for the event is $15 advance purchase or $20 at the door. Tickets may be purchased from Farmers Bank (Pomeroy and Tuppers Plains), Baum Lumber, Summerfields or Chester Academy (Monday, Wednesday, Friday, Saturday, 10 a.m. – 4 p.m.). Or contact any member of the CSHA. Saturday, April 27 features a full slate of events beginning with the parade. The parade will begin at 10 a.m., with lineup in the area of the Pomeroy Ball Fields. The parade will makes its way from Pomeroy through Middleport, ending near The Blakeslee Center (former Meigs Junior High). Parade participants are encouraged to register through the Wolfe Mountain Entertainment website. Cash prizes, including a $1,000 first prize, will be given out for the winning floats. As announced recently, Ohio Governor Mike DeWine will serve as the Grand Marshal for the parade. Following the parade will be the unveiling of the time capsule at noon at the Meigs County Courthouse. The time capsule was buried in 1994 as part of the 175th anniversary celebration. A Civil War skirmish will then take place at 1 p.m. in downtown Pomeroy. Musical entertainment will begin at 2 p.m. with Nick Michael and The Susan Page Orchestra. The Renee Stewart Band will perform at 3:30 p.m., followed by Next Level at 5 p.m. The parade winners will be announced at 5 p.m.
At 6 p.m. will be the Civil War Ball at Wolfe Mountain Entertainment. Saturday will conclude with a performance by Metheney at 7 p.m.on the parking lot. Vendors will be set up on the parking lot throughout the day on Saturday with a variety of items and foods available for attendees. On Sunday, April 28 the celebration will move to the Meigs County Fairgrounds with Civil War Days. An ODNR Demonstration is planned for noon, with other kids’ activities from 11 a.m. to 5 p.m. The main Civil War Battle Reenactment will take place beginning at 1 p.m. The Civil War events are being organized by the 7th Ohio Volunteer Cavalry Civil War Reenactment Group. There will be space for vendors at the fair grounds. In addition to the Bicentennial Weekend events, the fourth Bicentennial Marker will be unveiled at 5 p.m. on Wednesday, April 17 in Letart Twp. The ceremony will take place near the entrance to Antiquity as travelers arrive from Racine. For more information on the Bicentennial plans visit the Meigs County Bicentennial on Facebook.